Brandon releases a Deschutes River wild steelhead. Brandon had never caught a steelhead on a floating line before and this morning on the Deschutes river showed promise. We walked down the sandy trail to the head of the run in the morning light. Three deer bounded ahead of us in the morning shadows as we made our way. Starting into the run I coached Brandon on the details of the swing telling him stories about other fish we had caught and how exciting the grab on the surface can be especially when you see the fish eat the fly! He was rigged with a Scandi line with a tapered leader and one of my favorite Deschutes patterns to be fished wet, just under the surface. The run we worked was a short run with big boulders sprinkled through it, just enough to make wading interesting that early in the morning. A heavy current split the river a short cast away encouraging migrating fish to hang out and rest on it’s edge in the protection of the big rocks. Brandon worked his line out 5 feet each cast from a stationary position. He had extended the line to the running line when a jolt straightened his line. A quick but solid tug that got our attention-could have been a hard tug from a trout, not definitely a steelhead. Because the line had wrinkles in it when the fly was hit I told Brandon to recast same spot but with no mend allowing the fly to swing a bit faster and hopefully elicite a sharper pull that would result in a good hookup. He did this with no response. Without moving or changing flies we tried one more thing; I asked Brandon to cast straight across stream and make a downstream mend thus swinging the fly much faster through the same spot. The fly ripped along, line tight and into the zone; just like clockwork a hard steady pull resulted and it was fish on! A hot wild steelhead was on the line and Brandon soon landed his first steelhead on the floating line but not without some lessons on swing momentum. Steelhead swingology is the about the quest we fly anglers are on looking for the perfect swing. 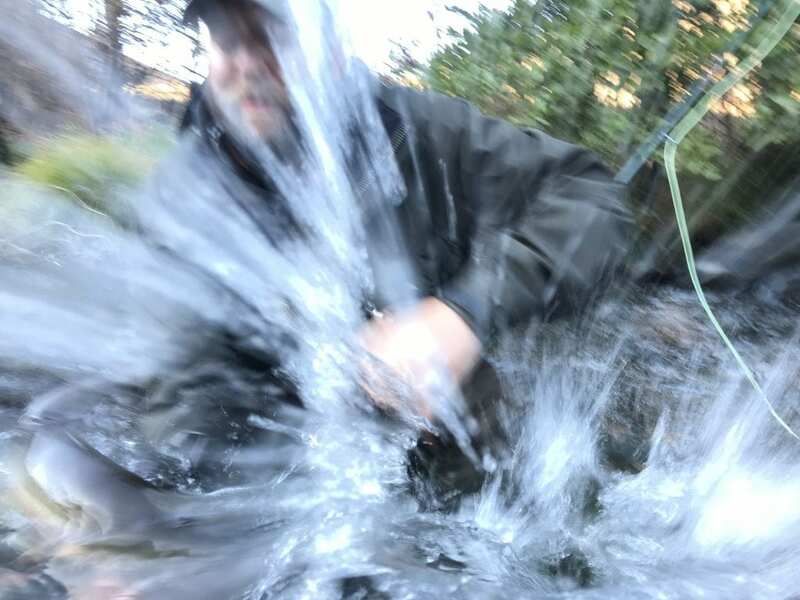 As a fishing guide who’s guided for over 25 years I’ve definitely seen a lot of things that work and many that don’t; good swing momentum is one that really works. In a group of 6 anglers one angler invariably catches more fish. In studying why that is the best answer I come up with is that they manage their swing better or to say it another way they have good “swing momentum”. The proper swing ellicites a response from steelhead that they cannot resist it’s movement. A fly swinging too fast or too slow or erratically will not produce as well as a fly with the right swing momentum. Often times good steelhead water allows the fly angler to simply hold on the rod and wait for something good to happen. 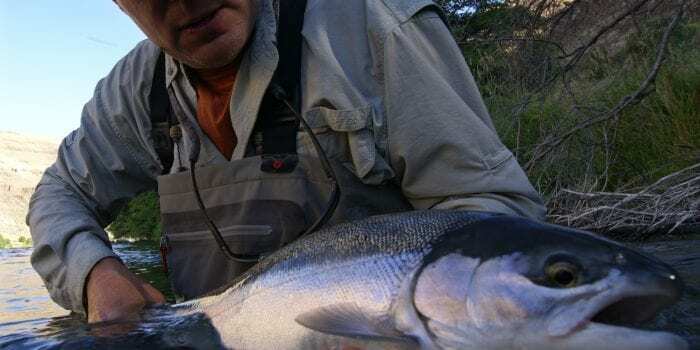 Perfect steelhead water will have that graduation of faster water in the middle to slower water on the edges where it simply straightens out your line and makes it move right. However many places that hold steelhead are not that perfect water. This requires swing management. To manage your swing movement properly is achieving a balanced swing speed across the water. This often requires slowing down your fly in fast water and speeding up your fly in slower water. Achieving the right balance is a difficult art and one that is developed with feel and time on the water. Expert steelhead anglers will tell you there is a certain feel to the right amount of tension on your line when the fly is moving through just right. This perfect swing is a hard concept to master because it’s difficult to convey exactly what is too fast and too slow. This will vary on conditions like winter vs. summer and water conditions/clarity/temperature. Mending or not mending your line is the primary way to manage your swing speed. More angle on the line to the current, the faster the swing; conversely, less angle on the line the slower the swing. Mends should be slow and smooth motions as not to disturb the fly, no flipping of the line. Where you stand in the run can impact your swing as well. By managing your swing you’ll catch more fish. Adjusting the line angle to the current is the best way to adjust your fly swing speed. Swing speed may need to be fast or slow depending the conditions. Mastering swingology will result in more hookups!